There are plenty of images that capture the essence of sublime athletic achievement, from a high-flying small forward posterizing a defender, to an OLB laying a quarterback flat as a poster. 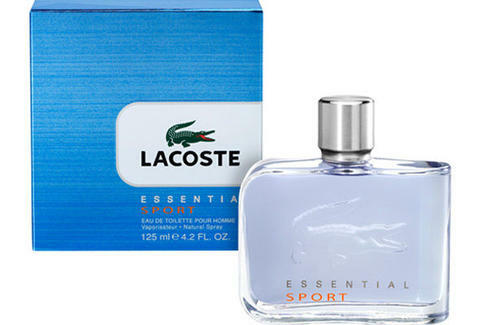 Now, a scent has captured the essential spirit of a player in the lead: Lacoste Essential Sport. Lacoste Essential Sport is an ice-cold-fresh fragrance crafted to evoke the best kind of winner: the guy who plays with optimism, sees the bright side, and finds a way through with elegance and style -- as opposed to the worst kind of winner, who keeps thanking people at awards shows even after the orchestra starts up. Classically packaged with the engraved Lacoste alligator seemingly swimming in an ocean of blue, the note-complexity runs 12-deep, hitting in three waves: the top includes Frosted Ginger, Tangerine, Bergamot and Pink Grapefruit, while the heart carries Nutmeg, Geranium, Green Splash accord, and Juniper, gin's chief botanical -- fitting, since you also stay dry under pressure. Finally, the base is bringing Vetyver, White Musk, Amber, and Patchouli, which you may know from its role as the heartwarming holistic MD in Patchouli Adams. To get deep inside Lacoste Essential Sport, head to lacoste-parfums.com -- it's just a click, no sublime athleticism required.